Travel bans: Sure, these save money this quarter, but at what cost? Teams must postpone meetings to understand customer needs, discuss prototypes, run trials, etc. Do you truly want your teams waiting to grow your business? Spending freezes: If you delay spending a few thousand dollars on industry expert consultations or lab testing… you could postpone millions of dollars in new-product revenue by months or years. Hiring delays: Failing to fill job positions brightens up today’s income statement, but you’ve made teams inefficient due to imbalanced resources, slowed their forward progress, and signaled what really matters to you. New assignments: Do you add more work assignments than remove? News flash: Your people are already overworked. It’s a delusion to think the new assignment you just gave didn’t slow or halt progress elsewhere. Re-organizations: Keep these few, far between, and low-impact. Picture this: Instead of letting your teams run on a flat, grassy field, you’ve made them slog through a muddy obstacle course as they re-sort priorities. Changes in strategy: Would you keep changing strategies in the middle of a chess game? Fine-tune it, but don’t assume a new leader requires a new strategy. Constancy of purpose and better execution may be what’s needed. It’s a delusion to think the new assignment you just gave didn’t slow or halt progress elsewhere. Second, concentrate your resources on fewer projects. Imagine you’re the traffic news reporter hovering over the freeway, and you notice a traffic jam with cars barely inching forward. What’s the solution? We can be sure it’s not adding more cars to the freeway on-ramp. Just as that freeway needs fewer cars to move faster, you need fewer projects. We learn this from Michael George in Fast Innovation: If your team members are over-loaded at 95% utilization, they will go sloooowly. But someone at 65% utilization will complete their tasks 4 times as fast. 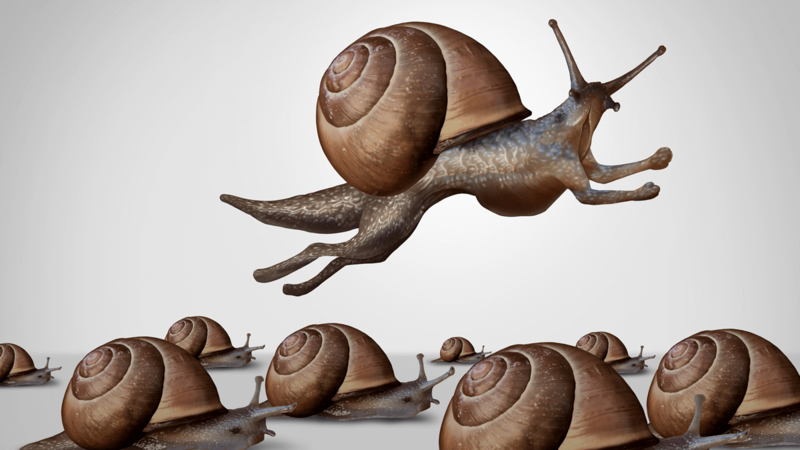 Do fewer projects, and heavily resource each of them so they can move rapidly. When I see a project with team members each giving only 10 or 20% of their time to it, I know this project will be around a looong time. Just as that freeway needs fewer cars to move faster, you need fewer projects. What if you could double your new-product resources, employing people that a) understand your technology and markets, b) cost nothing to bring on, and c) can start work tomorrow? It’s simple: Kill your dead-end projects. Research shows that nearly half of R&D spending is on work that does not lead to successful new products. 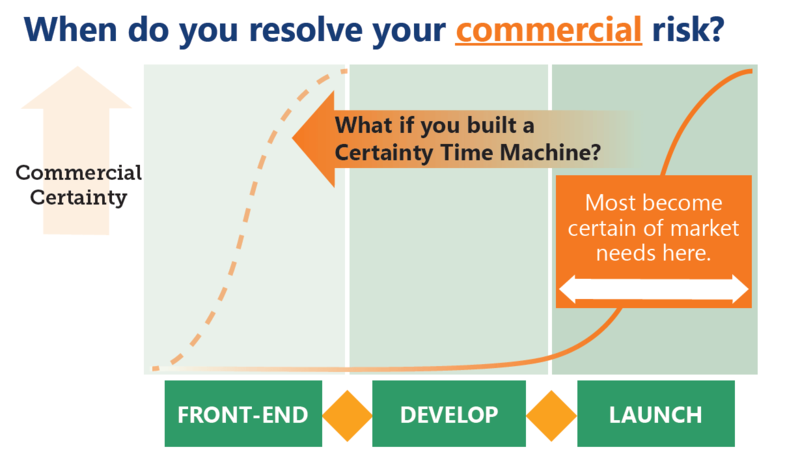 Our experience says most B2B companies wait far too long to kill their projects. What must be known to kill a project—especially for commercial reasons—is knowable much earlier than most realize. B2B customers have high knowledge, interest, objectivity, and foresight. This means they can tell you what’s needed to significantly reduce your commercial risk in the front end. For more, see our white paper, Timing is Everything. B2B businesses can resolve most of their commercial risk in the front-end of innovation… instead of being surprised later. Evidence of customer needs in this market: Qualitative VOC isn’t enough. Teams must provide quantitative data—direct from customers without bias or filtering—showing what customers want. How does this accelerate new product innovation? It does this in three ways. First, it prevents hesitation. We’ve seen many opportunities that were “talked about” for years and years within the business. When teams presented management with hard evidence of customer needs (Market Satisfaction Gaps from New Product Blueprinting), the projects finally moved forward, usually with great success. Second, front-end quantitative data prevents second-guessing and dead-end detours. As Netscape founder, Jim Barksdale, said “If we have data, let’s use it. If we have opinions, let’s use mine.” There’s nothing like irrefutable evidence from customers to focus your team like a heat-seeking missile on what really matters. Third, solid front-end work kills bad ideas quickly and efficiently. As noted above, you simply don’t have enough resources to squander them on dead-end projects. In our work with clients, we watch many, many projects get stopped or redirected in the front-end. The front end is precisely when this should take place, so celebrate when it does. The wise business leader treats innovation as a fragile seedling to be sheltered and nurtured. The wise business leader treats innovation as a seedling to be sheltered from distractions, treated with care, and prized as the very lifeblood of their company’s future. Shortsighted leaders see innovation activities as costs to be endured or manipulated for this quarter’s financial report. When an organization understands that its leaders see new-product innovation as the key to its future, good things happen. Team members inherently want to understand and meet customer needs; often telling their families later how they made a real difference. Leadership is often less about “motivating” employees to do this, and more about giving them tools, training, and environment… clearing a path for innovation. Some leaders’ net impact on innovation is more negative than positive due to their short-termism and its fruit: organizational friction, resources spread too thinly, and hurried front-end work. These leaders would boost innovation by staying home. These leaders would boost innovation by staying home. Get these things right and you’ll see profitable, sustainable growth. And you’ll see it faster.